Biocrusts are important functional units in dryland ecosystems. Regarded as ecosystem engineers, cyanobacteria in biocrusts contribute several major physico-chemical and biological processes. However, the role of cyanobacteria in the process of loess formation has been underestimated. Recently, their contribution to sediment development was presented in the BLOCDUST model of loess formation. This perspective paper features the environmental impact of cyanobacteria and biocrusts with a focus on processes involved in the formation of loess sediments. We propose that the formation of loess can be mediated by cyanobacteria, including initial trapping, and the accumulation and preservation of loess-forming particles. Moreover, the initial structure may be further altered by weak mineral weathering, dissolution and mineral re-precipitation due to cyanobacterial metabolic processes. Possible negative aspects of environmental impact related to the potential toxicity of cyanobacterial biocrusts are also discussed. We highlight specific biotic-abiotic interactions between biocrusts and loess (e.g. exudation of organic polymers, carbonate dissolution and re-precipitation, and dust-dependent metabolic activities of cyanobacteria) which are essential for the formation of stabilized loess and propose the term “synergosis” to comprise these interactions. The role of cyanobacteria in loess formation has only recently been recognized and the possible biogenic nature of loessification is underestimated as compared to their eolian nature. Mineral weathering and mineral precipitation processes as well as mineral dust flux between litho- and atmosphere mediated by cyanobacteria and biocrusts require more attention due to their significant contribution to ecosystem properties. The online version of this article ( https://doi.org/10.1007/s11104-019-04048-3) contains supplementary material, which is available to authorized users. Throughout the world, drylands are the most often encountered biotopes of biocrusts (Makhalayane et al. 2015; West 1990), where they can cover up to 70% of the surface (Buis et al. 2009; Karnieli et al. 2002). Biocrusts are present on all seven continents and in all climatic regions (Belnap and Lange 2003). They are particularly significant in the ecology of arid and semi-arid regions (Belnap 2006; Chamizo et al. 2012; Kidron et al. 2010). Biocrusts represent associations of sediment/soil particles with bacteria, cyanobacteria, algae, fungi, lichens and mosses (Belnap and Lange 2003; Chamizo et al. 2012; Evans and Johansen 1999; Hu et al. 2002a) and their secreted metabolites (primarily exopolysaccharides) (Lan et al. 2012), as well as microfauna (Pócs et al. 2006). As a highly productive microenvironment, biocrusts establish and control basic physico-chemical processes of the ground surface, influencing environmental properties at micro and macro scales. Biocrusts also influence soil development, hydrological processes, water and energy balance, nutrient content, soil temperature, movement of gases, eolian particle (dust) uptake and deposition and eventually, plant community development (Weber et al. 2016). Biocrust diversity is characterized by spatial and temporal variability (Williams et al. 2013), resulting in a succession of autochthonous life forms, with cyanobacteria being common components (Belnap 2001; Lan et al. 2013). The abundance of cyanobacteria in biocrusts of arid and semi-arid regions distributed around the world is significant (Colesie et al. 2016, Fig. 9.4). The cyanobacteria observed in biocrusts belong to at least 48 genera, of which 8 genera are present in all investigated regions (Colorado, Southeastern Utah, Northwestern Ohio, Mexico, India, Southern Africa, Israel, Iran and Spain) (Online Resource 1). Xerotolerance is one of the major ecophysiological adaptations shaping microbial communities in arid and semi-arid conditions. Cyanobacteria tend to dominate microbial populations in desert biocrusts (Makhalayane et al. 2015; Potts 1994), reflecting their successful survival strategies against desiccation, the ability to cope with transient changes between hot/dry and warm/humid conditions, and versus exposure to high irradiance by visible and UV light (Whitelam and Codd 1986). Cyanobacteria can function as primary colonizers via their ability to grow photoautotrophically and the capacity of some members to fix atmospheric nitrogen. Surface colonization can be further enabled by the production of exopolymeric substances (EPS) leading to biofilm formation or to complex, multilayered microbial mats. Cyanobacterial EPS contains sulphate groups and uronic acids, which give the EPS an anionic and sticky character (Rossi and De Philippis 2015). The EPS layer also minimizes water loss and reduces UV irradiation reaching the cells, thus protecting against abiotic stress factors. Microalgae and mosses are generally unable to function as primary colonizers of constrained environments themselves, and depend on cyanobacteria to provide stable hydrated microenvironments with necessary nutrients (Zhang et al. 2015). In addition, cyanobacteria possess extensive metabolic responses that help them to cope with fluctuations in moisture and irradiance, and to pass through active-dormant-active transitions. Efficient protection of macromolecules constitutes one survival strategy of extremophilic and extremotolerant cyanobacteria. Protein denaturation in water-deficient cells is prevented by the accumulation of osmolytes including, intracellular sucrose and trehalose in drought-resistant cyanobacteria (Hershkovitz et al. 1991). Further defense mechanisms are used against reactive oxygen species (ROS) which cause damage to membranes, nucleic acids and proteins (Whitelem and Codd 1986; Billi and Potts 2002). ROS generation is accelerated under typical dehydrating conditions, i.e. strong sunlight/UV irradiation. Damage by ROS is partly controlled by cyanobacterial Fe-superoxide dismutase that neutralizes formed superoxide radicals (Shirkey et al. 2000). To prevent ROS generation by UV, cyanobacteria synthesize UV-absorbing scytonemin (Garcia-Pichel and Castenholz 1991) and mycosporine-like amino acids (MAAs) (Cockell and Knowland 1999; Garcia-Pichel and Castenholz 1993; Rastogi et al. 2014). The role of biocrust cyanobacteria in sediment particle accumulation and preservation of land surfaces has long been recognized (Belnap and Gardner 1993). The BLOCDUST hypothesis (Biological LOess Crust – DUSt Trapping) (Svirčev et al. 2013) postulates the role of cyanobacterial biocrusts in the process of loess formation. According to this hypothesis, the accumulation/growth of loess sediment in arid and semi-arid regions is supported via the trapping and accumulation of airborne dust particles during wet events by sticky cyanobacterial EPS. Intervening dry periods provide conditions for the preservation of particles captured and covered by firm biocrusts. Loess and related deposits are one of the most widespread Quaternary aeolian sedimentary formations, most abundant in semi-arid regions of inner Eurasia (Muhs 2013; Smalley et al. 2011). They present and preserve parent material for the synsedimentary formation of soils, such as fertile chernozem. Moreover, loess has a more applied role and presents a widespread building ground with specific geotechnical properties (Sprafke and Obreht 2016). Despite its importance, the processes required for loess formation are still not fully understood (Sprafke and Obreht 2016). Loess is usually defined as eolian sediments formed by the accumulation of wind-blown dust particles. However, this definition does not cover post-depositional processes related to the formation of loess structure. Typically, loess sediments have homogenous and highly porous structures, with particles loosely cemented by microcrystalline calcium carbonate derived from corrosion and re-precipitation of detrital carbonates (Muhs 2007; Muhs and Bettis 2003; Pésci 1990; Smalley et al. 2006). The formation of a typical loess structure is usually attributed to a process called loessification. Unfortunately, this process is still poorly understood because it is related to processes similar to pedogenesis (neo-formation of clays and Fe-oxides, and carbonate re-precipitation) and diagenesis (cementation of the particles and stabilization of sediment structure), placing loessification in between those processes (Pécsi 1990, 1995; Sprafke and Obreht 2016). In addition, the mechanisms of particle entrapment during dust accumulation are not fully understood. The role of cyanobacteria within biocrusts and processes related to their activity, however, have the potential to explain the processes of particle entrapment, accumulation and preservation. Here, we propose processes facilitated by cyanobacteria and their relation to loess formation. Besides construing the bio-geological importance of cyanobacteria and biocrusts, this article proposes distinct definitions of some ambiguous key terms and introduces a new term: “synergosis”. Further, the possible health significance of dust particle accumulation and of toxins potentially produced by biocrust cyanobacteria is also discussed. There is a lack of clear definitions in the terminology of biological crusts. According to some definitions, biocrusts are characterized by periodical or permanent surface features influenced by factors including soil structure and type, irradiance, topographic attributes (Belnap 1995; Hu and Liu 2003; Lange et al. 1997; Zaady et al. 2000), mineral resources and water (Pickett and McDonnell 1989). We refer to a biocrust as a hardened, crisp structure formed by drying, consisting of living but dormant, highly specialized organisms in close association with sediment/soil particles. In describing the changes in biocrust physical properties, some language problems can lead to the use of terms that are redundant (pleonasms) or even contradictory. It can be easily observed that environmental changes between dry and wet events readily lead to a shift between the desiccated and hydrated appearance of biocrusts. In this context “dry biocrust”, the term commonly used in the literature, is pleonastic and “wet biocrust” is contradictory. When a biocrust becomes hydrated and active due to wetting, it can act as a biological terrestrial mat, a fully functional biological community. The early-developmental stages of hydrated biocrusts (Zhang 2005) improve the surface microenvironment, which in turn provides further aid to colonization and supports the survival of later successional stages (Acea et al. 2003; Hu and Liu 2003; Kurina and Vitousek 1999; Langhans et al. 2010; Lukešová 2001). By synthesizing significant amounts of EPSs, cyanobacteria can promote further growth of the microcommunity and may enable protozoa, small invertebrates and microfungi to become established. Biological terrestrial mat development continues until a climax community is established under given environmental conditions. Further successional steps may lead to the formation of vegetation (if the wet period continues) or the community may reverse to the crust stage (if dry conditions return). So far, biocrusts have been referred to by multiple names (cryptogamic, microbiotic, cryptobiotic and microphytic crusts) indicating some common features of the constituent organisms, but the most often-used term is “biological soil crust” (BSC) (Belnap et al. 2003a; Langhans et al. 2009). Many factors can be used to classify BSCs (Belnap 2003a; Berkeley et al. 2005; Dougill and Thomas 2004; Langhans et al. 2009; Pócs 2009) but especially important are the physicochemical properties of the growth surface (Chamizo et al. 2012). Regarding this factor, the question arises as to whether the term biological soil crusts can be used for all biocrusts. Declaring all biocrusts as soil crusts can lead to misunderstandings in both a scientific and etiological sense. Crust types differ from physical crusts to biocrusts, where different biological crust types can be described and called by specific names: biocrusts formed on soil, loess, sand, rocks and other substrates, differing in physical and chemical properties. While substrates, such as unconsolidated sediments (e.g. sand), and sedimentary, metamorphic or magmatic rocks are provided with a clear definition of their structure and genesis, this is not the case with the loess substrate. The specificity of loess lies in its polygenetic nature (Sprafke and Obreht 2016), determined by complex environmental sedimentary and post-depositional processes (Svirčev et al. 2013). While the process of loess formation remains to be fully understood and defined, it is certain that quasi-pedogenic and quasi-diagenetic processes have determined its present structure (Smalley and Marković 2014). Due to its high specificity, loess cannot be regarded either as a weakly consolidated sediment, soil, or rock, but as a distinct entity (Sprafke and Obreht 2016). For example, dust deposited to marine or lacustrine sediments is not loess because of the absence of the loessification process. In this regard,we propose the terms biological loess crusts (BLC) and biological loess mats (BLM) for consideration (Fig. 1). The length of dry and wet events, and shifting frequencies between BLC and BLM have an effect on initial processes of loessification, as discussed below. By the 1990s, it was concluded that loess is “not just the accumulation of dust” (Pécsi 1990) and a discussion on (abiotic) cementing agents of silt particles emerged (Sprafke and Obreht 2016). However, biocrusts are known to trap airborne dust and consequently cement it, as a part of the life strategy of crust organisms (Danin and Ganor 1991; Pietrasiak et al. 2014; Williams et al. 2012; Zaady and Offer 2010). The accumulated dust particles contribute to the growth- and further strengthen the cohesion of BLC and BLM (Hu et al. 2002a; Felde et al. 2017). In a field study (Zaady and Offer 2010), cyanobacterial crust components were shown to provide a unique contribution to the loess desert ecosystem by significantly enhancing atmospheric particle accumulation. According to the BLOCDUST hypothesis (Svirčev et al. 2013), loess sediment growth in arid and semi-arid regions is facilitated in the same manner, via trapping and accumulation of airborne dust particles by sticky EPS during wet events (Fig. 2). The particles are then processed through a series of weathering reactions, and translocated downward as cyanobacteria move up toward the light source. When biological activity halts during the dry period, the trapped particles remain immobilized and turn into constituents of cohesive BLC that resists wind erosion. The switch between the wet and dry conditions and associated processes represents one cycle of accumulation. The compilation of such cycles results in the initial growth of loess. The BLOCDUST hypothesis describes and emphasizes the role of BLC and BLM cyanobacteria in the process of initial loess formation and stabilization in arid and semi-arid environments. Stabilization of the soil surface mediated by cyanobacteria within biocrusts has been documented in numerous studies (Table 1). The stabilized soil surface is characterized by an enhanced compressive strength and a higher resistance to accumulated raindrop kinetic energy than that of bare soils. Two main mechanisms of stabilization are distinguished: the immobilization of soil particles through an extensive filamentous network (coarser particles) and the adhering of particles on the EPS surface (finer particles). Through their EPS, cyanobacterial communities enhance cementation between the trapped particles through bioweathering, mineral disaggregation and subsequent mineral precipitation. Current knowledge of these processes within biocrusts is meager and necessitates more studies, both in the field and laboratory. An overview of the weathering processes in lithic environments related to biocrusts is presented in Garcia-Pichel et al. (2016). - cyanobacterial EPS and positive charges in soil bind together and form soil conglomerates, fixing free sand particles. - compression strength of biocrust-covered soils depends on the amount of EPSs produced. The complex structure of cyanobacterial EPS includes extracellular polysaccharides, organic acids (e.g. uronic acids), UV protective pigments, proteins, nucleic acids, lipids, reactive functional groups (e.g. sulphates, phosphates) and peptides. Such composition provides EPS with favorable properties for the bioweathering and mineral disaggregation of trapped particles mainly through the activity of incorporated organic acids (Viles 1995). The chemical composition of EPS is not enough to cause weathering of mineral particles itself: specific micro-environmental conditions are also required. The basic metabolic processes of aerobic respiration and photosynthesis regulate the O2/CO2 ratio and establish oxidizing/reductive, alkaline/acidic microenvironments respectively, which further promote mineral dissolution in the contact zone of the EPS with mineral particles. The required micro-environmental conditions for weathering of minerals depend upon their crystalline structure (Wolff-Boenisch et al. 2006), with carbonates having higher weathering rates than silica minerals. 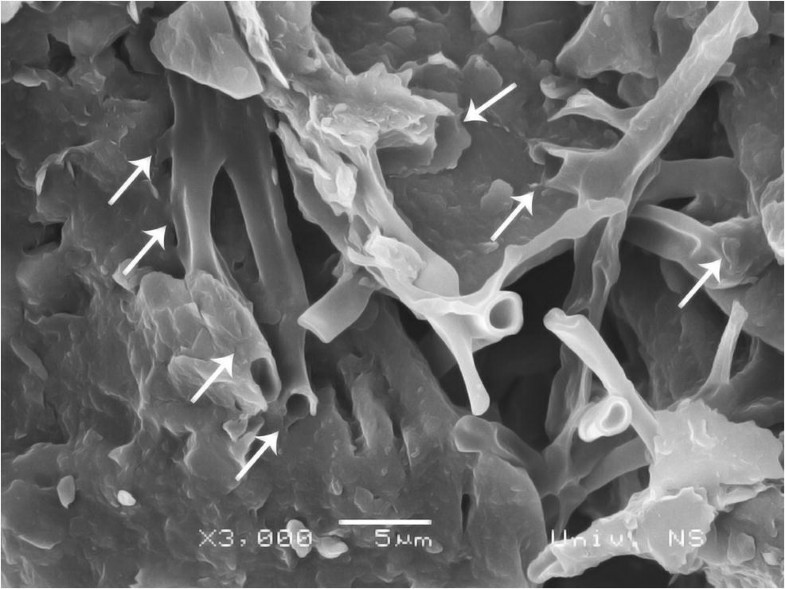 Cyanobacteria-driven dissolution of carbonates is considered to occur during aerobic transpiration, providing increased CO2 concentration and a slightly reductive, acidic environment (Danin 1983; Garcia-Pichel 2006). In some cyanobacteria, dissolution is also supported by a highly specific Ca2+ uptake and transport mechanism driven by P-type Ca2+-ATPases (Garcia-Pichel et al. 2010; Ramírez-Reinat and Garcia-Pichel 2012). Contrary to carbonates, siliceous substrates are of a much lower weathering rate, primarily due to high Si-O bond abundance, which tends to be the strongest and most resistant to dissolution. However, weathering of silicates in sandstones in arid landscapes mediated by cyanobacteria was observed by Büdel et al. (2004) and a similar scenario of silica weathering was predicted to occur in cyanobacteria-dominated desert biocrusts (Garcia-Pichel and Belnap 1996). Bioweathering in terrestrial environments mediated by cyanobacteria is recognized as a survival mechanism (Gorbushina 2007). In BLC communities, the airborne particles present the main source of essential mineral nutrients (Svirčev et al. 2013). Through weathering of mineral particles including feldspars, muscovite, amphiboles, pyroxenes, apatite and dolomite, cyanobacteria acquire bio-essential elements (Ca, Na, K, P, Mg, Fe) of which Fe2+ is crucial for photosynthetic activity (Rubin et al. 2011). The change in redox conditions of the microenvironment from acidic to alkaline caused by cyanobacterial photosynthesis and silicate weathering induces the subsequent precipitation of carbonates from formerly dissolved detrital carbonate and atmospheric CO2 (Goudie and Viles 2012). The alkaline state of EPS induces the deprotonation of functional groups providing binding sites for cations (e.g. Ca2+, Mg2+, Fe2+) (Braissant et al. 2003), while their binding is further supported by the uronic acids present (Braccini et al. 1999). The capacity of EPS to bind cations can be saturated in the case of their constant supply when all of the available functional groups of the polymer are occupied. The remaining available cations combined with alkaline micro-environmental conditions can initialize nucleation of carbonate species on the surface of the EPS in the contact zone with mineral particles (Dupraz et al. 2009), providing a mineral cement between the particles and the EPS (Fig. 3) which is crucial for the permanent immobilization and preservation of the particles. The EPS-influenced organomineralization presented here occurs as a passive, biologically-influenced process, driven by changes in the physical state of the organic exopolymer (Dupraz et al. 2009; Trichet and Défarge 1995). Microbial organomineralization commonly appears in sedimentary biofilms found in aquatic environments (Gallagher et al. 2010) and was recently recognized in cyanobacteria-dominated BLC (Dulić et al. 2017). Chemical leaching of airborne dust particles followed by organomineralization and subsequent precipitation could lead to the formation of mineral bonds between the particles, resulting in their slightly cemented state. However, cementation through bioweathering and mineral precipitation promoted by cyanobacterial activity should not be confused with the weak cementation of loess particles influenced by post-depositional large-scale silicate weathering and precipitation of secondary carbonates, which is one of the main characteristics of loess in arid and semi-arid regions (Pécsi 1990, 1995; Sprafke and Obreht 2016). The main role of biocrusts and, in this case cyanobacteria, is in particle stabilization, preservation and erosion prevention. Cyanobacterial weathering is related to the onset of weak particle alterations followed by EPS mineralization (calcification/silification) and meager carbonate precipitation, enhancing the formation of primary loess structure. In contrast, alteration and weathering of deposited loess on a larger scale is a consequence of increased humidity, the consequential increase in other microbial activity, the development of higher vegetation and consequent increase in humic acids. These processes are related to loessification in the mature phase solely under humid and relatively warm conditions, when deposited loess is strongly influenced by pedogenesis. As a result of those processes, a neo-formation of clays and Fe-oxides occurs, as well as precipitation of carbonate from original horizons and secondary carbonate formation in lower horizons. The BLOCDUST model proposes that loess formation in arid and semi-arid environments is suppored by BLC and BLM cyanobacterial activity, influenced by environmental shifts between dry and wet events. Stabilization and preservation of the deposited material against wind and water erosion is a central phenomenon in the initial process of loess genesis (Svirčev et al. 2013). The presented scenario may describe not only trapping, deposition and preservation of particles induced by cyanobacteria, but also may shed light on loess granulometry, magnetic properties, thickness, permeability and geographical zonation. From this point of view, loess is not only an eolian sediment (Pécsi 1990; Smalley et al. 2011; Sprafke and Obreht 2016) but is also a biogenic one. Therefore, the processes discussed here should be further assessed in field and laboratory studies to fully understand the bio-geo interactions influencing loess formation. Moreover, it remains to be explored how useful are cyanobacterial biomarkers in assessing this issue and also in paleoclimatic reconstruction, since loess is known as one of the best terrestrial paleoclimate and paleoenvironmental archives (Kukla 1977; Marković et al. 2008; Marković et al. 2011; Pécsi 1990; Pye 1995; Schaetzl et al. 2018; Smalley et al. 2011; Sprafke and Obreht 2016; Stevens et al. 2011; Yang and Ding 2014). After the presented analysis of the processes and components involved in LPS formation, it is appropriate to give a synthesis of the events leading to loess formation. We propose a new term, synergosis, for a special, sustainable relationship between certain biotic and abiotic constituents located in direct contact and “benefiting” from each other. The following text presents the relationship between BLC and loess as an example of synergosis. The result of this synergotic interaction is stabilized loess. Similar relationships can also be found in some other biogenic formations in nature (soil, stromatolites, travertine, sinter, calcareous nodules and other biogenic rocks) (e.g. Kleinteich et al. 2017; Reid et al. 2000; Riding 2000). The term synergosis originates from the word synergos (Greek συνεργός), meaning “working together” (from syn- “together” plus ergon “work”). The term synergy originates from the same root, which is defined as the benefit that results when two or more agents work together to achieve something neither one could have achieved on its own (Corning 2005). The suffix -osis denotes a process, condition, state or action. Synergosis is thus conceived as a bio-abiosis, and is intended to describe the productive efficiency of living and non-living parts of nature when they are “working” together. It represents a close, long-term, productive, sustainable and advantageous interaction between biotic and abiotic components coupled in a physical association. In this sense, the parallel and simultaneous existence of both, BLC and loess deposit, i.e. stabilized loess, is the product of synergosis. The success, or if a more neutral expression is desired, the strength of the synergotic interaction in this particular case, is measured by the systematic stabilization, maintenance and spreading of stabilized loess and the loess environment. Inspiration for the introduction of the term synergosis was found in the related term “symbiosis”, which defines an interaction between different organisms living in close physical association, usually to the advantage of each of them, or any type of close and long-term biological interaction between two different organisms (Martin and Schwab 2013). In any case, symbiosis, as a qualitatively different creation based on the relationship between its members, refers to living partners. Lichen, as an example of symbiosis, is an association formed by microalgae and/or cyanobacteria and microfungi, each of which receives significant benefits from the association, sometimes so much, that they cannot grow as vegetative forms outside of the symbiosis. In parallel with this example, stabilized loess is a consequence of synergosis between living and inanimate units of nature: BLCs and loess. In principle, any plant communities growing in arid and semi-arid regions may serve as a biocomponent in the described synergosis. A further significant difference between symbiosis and synergosis is that symbiosis typically involves individuals or small communities, while synergosis involves larger-scale (and longer-term) interactions. Due to the interaction of BLC and loess constituents, a stable (not transient) but growing product, stabilized loess, emerges. Our premise is that BLCs, as the biotic unit, on the surface of loess are actively involved in the accumulation, sedimentation and stabilization of airborne particles (mainly dust) during loess formation, while the abiotic unit (loess and its constituents) at the same time serves as the physical substrate and a source of mineral nutrients for the growth of the BLCs. By working together in this way, BLCs (and/or suitable plants) and windblown dust, later becoming stabilized sedimentary deposits, constitute, sustain and expand the loess environment as final result of the intitial synergotic interaction. Loess-paleosol sequences (LPSs) are among the best preserved terrestrial Quaternary archives (Hao et al. 2012; Marković et al. 2011; Muhs 2013; Obreht et al. 2016; Obreht et al. 2019) although their formation in China may have started as early as the Miocene (Guo et al. 2002). The successive layers of loess and paleosol formations evidence past environmental changes, primarily in the past dynamics of dust, vegetation cover and the surface processes they influence. Loess formation is an ongoing process, which currently mostly takes place in warm and arid regions, including in China (Lehmkuhl et al. 2014), Israel (Zaady and Offer 2010) and Iran (Dulić et al. 2017; Kehl 2010). Since rainfall is highly limited in arid and semi-arid regions, dew, fog and humid air are considered potential sources of water in these regions (Kidron et al. 2002; Lange et al. 1992; Maphangwa et al. 2012). Such conditions support the development of dry (semi-desert) steppe vegetation, dominated by different developmental stages of biocrusts (Bowker and Belnap 2008; Rosentreter 1984). Dew has been found to play a role in biocrust activity (Rao et al. 2009a) and can promote the diurnal change between biocrust active and dormant states. Biocrust organisms are also recognized to promote dew formation (Fischer et al. 2012; Liu et al. 2006; Rao et al. 2011). The limited water availability favours the endurance of BLC compared to higher plants during prolonged dry periods and enables rapid development of BLM during intervening short wet periods (e.g. dew). Zaady and Offer (2010) have demonstrated that morning dew is a sufficient moisture source for cyanobacterial biocrusts to trap atmospheric dust. The BLC-BLM change and the reversibility of the process are essential for loess formation (Fig. 4) and may contribute to relatively high accumulation rates of loess during glacial periods. In the transition from stadials to interstadials, a gradual increase in annual moisture availability would prolong a BLM stage An intensified BLM stage would in turn advance grass species and thus influence the development of successional stages of loess (Fig. 4). Further change towards a warm and humid climate (e.g. changes atglacial to interglacial level) would result in a general vegetation change to the forest-steppe type, characterized by a dense vegetation cover of grass, shrubs and trees. Warm and humid climate conditions and a high biomass content would intensify synsedimentary pedogenesis and the formation of soil horizons. Subsequent soil formation from the Ah-horizon of the chernozem or phaeozem, to the B-horizon of the cambisol or luvisol (Bronger et al. 1998; Bronger 2003) is a consequence of a change from semi-arid to more humid climatic conditions and the significant presence of higher plants (Fig. 4). If the climate changed towards a dryer and colder type, vegetation cover would be reduced and paleosol horizons would be buried by new layers of loess, contributing to the growth of total LPSs. Throughout semi-arid and arid areas biocrusts stabilize surfaces against wind and water erosion (Belnap 2003b; Belnap et al. 2003b; Eldridge and Leys 2003; Makhalayane et al. 2015; Rodríguez-Caballero et al. 2013). As sediment surface protectors, biocrusts are highly vulnerable to the compressional and shear forces generated by off-road vehicles (e.g. four-wheel drive trucks, all-terrain vehicles and military vehicles), trampling and grazing by livestock and different human activities (Belnap and Eldridge 2003; Belnap et al. 2007; Kovda 1980; Williams et al. 2008). Due to their sensitivity to anthropogenic and natural disturbance, they are in a degraded state in many areas under extensive erosion by wind (Belnap and Gillette 1998; Maestre et al. 2006). The wind and water erosion of (disturbed) biocrusts are thought to lead to a chain reaction as exposed and windblown silt from the substrate has more abrasive force than the wind itself. A disruption in the biocrust may thus lead to that of a larger area. On a regional and long-term scale, land use in loess regions and consequent erosion cause colluviation, while climatic fluctuations are of only secondary importance for colluviation (Lang 2003). The process of wind erosion of biocrusts may affect human and animal health in two ways. One concern is related to the inhalation of dust induced by the lack of biocrust cover. Loess environments may be hazardous, threatening human occupation, health and livelihood (Derbyshire 2001). North-western China is a major source of windblown dust originating from loess deposits that can adversely affect both human and animal health. The volume of loess being lost from the Chinese Loess Plateau close to Huang He (Yellow River) in a single year is equivalent to the thickness of loess accumulated over 100–300 years (Dai 1987). Written records of the past 500 years suggest that 2–36 dust storms per year occur on or near the Chinese Loess Plateau. Dust storms also influence the quality of life conditions in Beijing, which lies more than 1000 km from the source area (Liu 1985). The effect of such dust upon human health in these extensive loess regions, including many large cities, has still to be fully evaluated, but pneumoconiosis (non-industrial silicosis: NIS) is thought to affect about 24 million people in North-western China (Dai 1987; Derbyshire 2001; Liu 1985; Xu et al. 1993). In one highly exposed village, 45% of a random sample of 150 adults aged 30 and over had the disease (Norboo et al. 1991; Saiyed et al. 1991). Further atmospheric aerosol formation of novel particles has been characterized in China originating from loess dust by condensation, coagulation and photo-induced, surface-mediated reactions (Nie et al. 2014). The toxicology and ecotoxicology of these particles requires investigation. Another potential health risk in arid and semiarid regions is via the inhalation of wind-blown biocrust particles, which may include cyanobacterial metabolites produced in BLM during the wet- and preserved in BLC during the dry events. Terrestrial and aquatic cyanobacteria can produce a wide range of potent toxins (cyanotoxins) (Metcalf and Codd 2012) of both ecotoxicological and human health relevance. The ecotoxicology of cyanotoxins in terrestrial settings is still poorly known and has to be extrapolated from the more intensively studied production, fates and health significance of these potent cyanobacterial products in aquatic environments. Some of the cyanotoxins, including hepatotoxic microcystins which are inhibitors of the protein phosphatases and phosphoprotein phosphatases of humans, animals and plants, are bound to have adverse effects on practically any eukaryotic organism in any environment provided adequate exposure levels and cellular uptake mechanisms exist (Metcalf and Codd 2012). For humans, the highest risks in the arid and semi-arid environments seem to be associated with the inhalation of toxin-containing cyanobacterial dust and aerosolized cyanotoxins from the biocrusts. Low but toxicologically relevant amounts of microcystins (3 to 56 μg m−2) have been found in desert biocrusts in Qatar (Metcalf et al. 2012). There is also evidence of cyanobacterial neurotoxins in Qatar desert biocrusts. β-N-methylamino-L-alanine (BMAA), produced by aquatic and terrestrial cyanobacteria, is a non-encoded amino acid and suspected environmental risk factor for sporadic amyotrophic lateral sclerosis (ALS) and related human neurodegenerative diseases (Bradley and Cox 2009; Nunn 2017). The BMAA neurotoxin isomers, 2,4-diaminobutyric acid (2,4-DAB) and aminoethylglycine (AEG) also occur and persist in the Qatar cyanobacterial biocrusts (Metcalf et al. 2015; Richer et al. 2015). 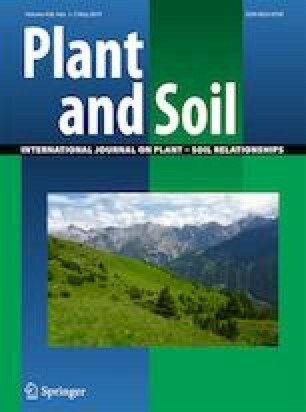 Anatoxin-a(S), an organophosphate, rapidly-acting cyanobacterial neurotoxin, has also been found in the Qatar cyanobacterial biocrusts and has been linked to lethal poisonings of dogs drinking rainwater from natural depressions on the crust (Chatziefthimiou et al. 2014; Metcalf et al. 2012). Information on the production and fates of cyanotoxins in loess material is lacking, although the high potential for cyanotoxin production by loess cyanobacteria by analogy with aquatic cyanobacteria (Metcalf et al. 2012) and the Qatar biocrust studies (Metcalf et al. 2012, 2015; Richer et al. 2015) motivate the analysis of loess material for cyanotoxins. The consequences of degrading and removing biocrusts are long lasting and need to be solved by complex restoration processes (Rossi et al. 2017; Zhao et al. 2016). Attempts have been made to establish artificial BSCs to stabilize soil and to reduce losses due to wind and water erosion. For instance, the concept of BSC carpet engineering has been proposed (Wei 2005). Restoration of exposed loess surfaces has been a great challenge in recent decades. Moss-dominated BLC have already been tested as a means to mitigate extensive loess erosion. While laboratory results were promising (Xiao et al. 2011; Zhao et al. 2014a), the successful implementation of field applications has differed significantly (Xiao et al. 2015), so the problem persists. For land restoration, much interest has been focused on the effects of cyanobacterial inoculation in arid and semiarid regions (Acea et al. 2001; Belnap 1993; Bu et al. 2015; De Caire et al. 2000; Hu et al. 2002a; Lan et al. 2014; Nisha et al. 2007; Rao et al. 2009b; Rossi et al. 2017; Tiedemann et al. 1980; Wang et al. 2009). Since the moss-dominated biocrusts are the last development stage of biocrusts and require a preceding adaptation of the habitat (Belnap 2003c), the restoration of exposed loess surfaces should be addressed with pioneering cyanobacterial species. Nonetheless, while producing artificial cyanobacterial biocrusts by inoculation and spraying in the field are feasible, their persistence in the field is still a future challenge (Bu et al. 2013; Rossi et al. 2015). Synergosis: a new term proposed here to describe large-scale biotic - abiotic interactions of a specific type. Stabilized loess would not develop without this beneficial interaction: the constituents of loess serve as a nutrient source for the organisms of BLCs, while BLC organisms bind and preserve dust in the form of loess. By working together in this way, BLCs and loess constituents form, sustain and expand stabilized loess as the result of synergosis. The role of cyanobacteria in loess formation (loessification) has only recently been recognized, and the possible biogenic nature of loessification is underestimated as compared to its eolian nature. The BLOCDUST hypothesis of cyanobacteria-promoted loessification needs to be tested in laboratory and field experiments to justify a potential theory for the eolian-biogenic formation of loess. With reference to cyanotoxin production, the significance of terrestrial cyanobacteria to human health is poorly understood compared to that of aquatic cyanobacteria. Information is needed on the cyanotoxin content of BLCto permit adequate human health risk assessment of airborne exposure to loess-derived particles. Inhalation of biocrust/dust particles caused by erosion can be considered as a potential health hazard. The practice of using cyanobacterial crusts for the stabilization and restoration of exposed substrates is still a developing field. ZS and SBM acknowledge the support of the Ministry of Education, Science and Technological Development of the Serbian Government (project number: 176020). ZS and JM thank the Oskar Öflund Foundation (Finland) for funding for BLC research. TD was supported by a grant from the Erasmus Mundus EUROWEB+ Scholarship Programme and an Åbo Akademi University doctoral research grant. Preparation of this publication was partly performed within the framework of the ERASMUS+ mobility program established between the University of Novi Sad Faculty of Sciences and Åbo Akademi University, Project Code 2017-1-FI01-KA107-034440. Open access funding provided by Åbo Akademi University (ABO).